NEW YORK (May 27, 2011) – Joseph King Kong Agbeko has been cleared by doctors to return to work and will defend his International Boxing Federation (IBF) bantamweight championship against undefeated rising star and World Boxing Council (WBC) Silver 118-pound titleholder Abner Mares, who will also defend his title, in The Bantamweight Tournament Final: Winner Takes All on Saturday, August 13, live on SHOWTIME (10 p.m. ET/PT, delayed on the West Coast) at a site to be determined. The highly anticipated 12-round world title matchup between New York-based Agbeko (28-2, 22 KOs) of Accra, Ghana and Mares (21-0-1, 13 KOs) of Hawaiian Gardens, Calif., by way of Guadalajara, Jalisco, Mexico, was originally scheduled for April 23, but was postponed when Agbeko was injured moments after arrival at Los Angeles International Airport for fight week. Doctors at a nearby hospital diagnosed the champion with sudden onset sciatica, a back injury. 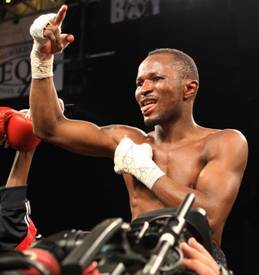 The August 13 SHOWTIME Championship Boxing telecast will be Agbeko’s fourth consecutive appearance on the network and the third in a row for Mares. Agbeko, who had never previously missed a fight, was told by a Los Angeles physician to receive treatment and wait six weeks before resuming training after the April 23 postponement. When he was cleared to fly, Agbeko returned to his native Ghana to rest but will return to New York next week to resume training. Agbeko will be making his first start since recapturing the IBF crown with an impressive 12-round unanimous decision win over then-unbeaten Yonnhy Perez in the bantamweight tournament semifinal on Dec. 11, 2010, in Tacoma, Wash. Agbeko convincingly won a thrilling give-and-take battle by the scores of 117-111, 116-112 and 115-113. Their exciting fight came in a rematch of a 2009 Halloween night slugfest that Perez won on points. It will also be the first fight back for Mares since the semifinals in Tacoma, where he rallied dramatically to earn the most significant victory of his career, a 12-round split decision win over former two-division world champion Vic Darchinyan in a bloody, knockdown-laden affair. Mares recovered from a deep cut along his hairline in the opening round, the first knockdown of his career in the second round and a point-deduction in the fourth round to floor Darchinyan in the seventh round en route to a victory by scores of 115-111, 113-112 and 111-115. The world championship fight will be promoted by Don King Productions and Golden Boy Promotions. A venue and an exciting undercard for the August 13 event will be announced shortly. For more information, visit www.donking.com or www.goldenboypromotions.com, become a fan on Facebook at www.facebook.com/GoldenBoyBoxing or follow the event on twitter at www.twitter.com/GoldenBoyBoxing or www.twitter.com/abnermares00. For information on SHOWTIME Sports Programming, including exclusive behind-the-scenes video and photo galleries, complete telecast information and more, please go the new SHOWTIME Sports website at http://sports.sho.com/.